SLAP tears are a common problem for overhead athletes among others today. There is no consensus per se in how to treat them and results following primary repair are mixed. Common complaints following a repair are persistent pain and stiffness. In the past, I have writtne about SLAP tears as well as outcomes for elite pitchers. In addition, I have discussed outcomes for type 2 SLAP tear revision surgery on this blog. What always concerns me (and more importantly patients who undergo surgery is how to achieve predictable pain relief and recover shoulder function. In the April 2014 edition of the American Journal of Sports Medicine, there is a level 4 prospective study by McCormick et al. looking at the efficacy of subpectoral biceps tenodesis as a viable solution for failed primary SLAP repairs. The study took place from 2006-2010 and all procedures were performed by 2 fellowship trained surgeons at a tertiary military facility. Subjects: Active-duty men and women b/w 18 and 50 years old who had arthroscopically confirmed type 2 SLAP lesions and who then underwent arthroscopic repair and were subsequently unable to return to duty(follow-up period was 2-6 yeaers with mean follow-up of 3.5 years). They also had to consent to a biceps tenodesis to address the failed repair. All told, 42 of 46 patients completed the study. The mean age was 39.2, while 85% of the subjects were male. Criteria to be included in the study: inability to return to active duty within a minimum 6 months of surgery, ASES score less than 75 at 1 year follow-up from the primary procedure, or patient electing to undergo revision surgery due to dissatisfaction with the primary results. Procedure: Biceps tendon was released and the remaining stump was debrided so the superior labrum was confluent with the remaining labral tissue. All sutures and loose anchors were removed. If the rotator cuff interval was inflamed, debridement with a 4.o mm shaver was used and/or radiofrequency wand was used. Next, a 2 cm incision was made in the axillary skin crease at the inferior border of the pec major. The biceps tendon was anchored 1 cm proximal to the musculotendinous junction using a nonabsorbable suture and 8 x 12 interference anchor fixation. Rehab protocol: Patients were in a sling for 4 weeks with no active biceps use for 6 weeks. They all underwent graded supervised physical therapy consisting of an initial 6-week phase of passive ROM exercise in addition to scapular and core strengthening. This was followed by progressive strengthening at 6 weeks and return to-duty-evaluation at 3 months post-op. Currently, there is no standard of care for failed SLAP repairs. One previous case control study by Boileau et al. found higher satisfaction in those undergoing biceps tenodesis compared to arthroscopic repair in the management of an isolated SLAP tear. Further, in the Boileau study there were no failed tenodesis procedures and those opting for that as revision had a full return to previous sports activity. This prospective study by McCormick et al. resulted in similarly high rates of return to previous activity and clinically significant improvements in outcome scores and ROM. There are several reasons why primary SLAP repairs may fail including: postoperative stiffness as a result inadvertent restriction of physiological biceps excursion or nonanatomic biceps anchor reduction, suture anchor pullout, suture granuloma formation, suture pullout, synovitis, glenoid osteochondrolysis from prominent hardware, a suprascapular nerve injury (due to prominent mendial hardware placement), and a delaminated long head of the biceps. It is also important to keep in mind the anterior-superior labrum and glenoid are poorly vascularized, and this is thought to limit the healing process. Persistent pain may manifest after surgery in light of the fact the proximal intra-articular portion of the long head of biceps tendon contains sensory and sympathetic fibers associated with shoulder pain. The authors’ findings at the revision procedure in this study suggest a consistent constellation of multifactorial complicating factors including: synovitis of the rotator cuff interval, loose knots, and a lack of healing at the glenoid interface. Boileua et al. Arthroscopic treatment of isolated type II SLAP lesions: biceps tenodesis as an alternative to reinsertion. Am J Sports Med. 2009;37(5):929-936. McCormick et al. The efficacy of biceps tenodesis in the treatment of failed superior labral anterior posterior repairs. Am J Sports Med. 2014;(42):820-825. Shoulder surgery is a big concern for any professional pitcher. I am currently rehabbing two MLB pitchers (one from a labral repair and the other from a Tommy John procedure and obviously not JV pictured above). They are doing great so far in their early rehab, but time will tell if they make it back to their pre-injury pitching levels. Overuse injuries in youth baseball players is always a huge concern I have. In fact, I speculate that early wear and tear may contribute to injuries seen down the road in HS, college or the pro ranks. I know from coaching and observing that more youth coaches need to familiarize themselves with pitch count guidelines and rest/recovery recommendations that Little League baseball now endorses. As a sports physical therapist who sees 12 year-olds with RC problems and torn UCLs and as a father/coach of a 10 y/o left-handed pitcher, I have a strong passion and vested interest in the welfare of baseball pitchers. While research does not equate increased injury risk with throwing curveballs and sliders to date per se, both of my MLB clients advise against it until athletes turn 14 or 15. “Elite” was defined as throwing in at least one game in MLB, minor league (A, AA, or AAA) or all collegiate divisions. Six level I-IV studies were included with enrollment from 1976 – 2007, and there were 287 elite male pitchers who underwent shoulder surgery with 99% on the dominant throwing shoulder. Most pitchers (276) were professional with a mean career length of 6.58 years. Post-operative clinical follow-up within these studies was 3.62 years. The statistics reveal more debridement of the labrum (61%) and rotator cuff (85%) versus repair. This is not necessarily surprising given the desire to minimize surgical intervention and loss of motion. The overall rate of return to sport was low at 68%. Performance declined for the 3 seasons prior to surgery and then gradually increased for 3 seasons afterward, but generally did not reach pre-injury levels. I have been attending the 26th Annual Cincinnati Sports Medicine Advances on the Shoulder and Knee conference in Hilton Head, SC. This is my first time here and the course has not disappointed. I have always known that Dr. Frank Noyes is a very skilled surgeon and has a great group in Cincinnati as I am originally an Ohio guy too. So, I thought I would just share a few little nuggets that I have taken away from the first three days of the course so far. I am not going into great depth, but suffice it to say these pearls shed some light on some controversial and difficult problems we see in sports medicine. Fixing SLAP tears may not always fix shoulder pain as in many cases it may be in part due to posterior capsule tightness and anterior instability leading to internal impingement. Additionally, many of the docs here choose not to repair type 2 tears in those over 40 tears and provide a biceps tenotomy or tenodesis to instead to deliver more predictable pain relief as opposed to a labral repair. 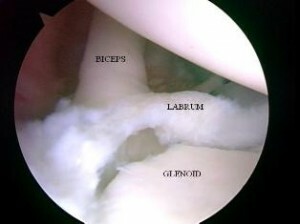 Intraoperative pain pumps in the shoulder are causing glenohumeral joint chondrolysis in the shoulder in many cases. According to the panel of docs, this has been seen in teenagers and patients in their twenties as well. They have often undergone other procedures from outside docs and then developed increasing pain afterward. Many have had to even undergo a total shoulder replacement after a few years post-op. The MDs here have suggested even post-operative Marcaine injections for pain relief in the shoulder should probably not be used. It was very sad to see an 18 y/o shoulder x-ray they put up that looked as if the patient was 80 years old. Increased femoral anteversion and torsion is a developmental factor that does in fact control the knee to a great extent. The tibial tubercle-sulcus angle, thigh-foot angle and foot alignment is also key according to Dr. Lonnie Paulos. In cases of miserable patella mal-alignment, many will need de-rotation and re-alignment procedures to improve their symptoms. The consensus among the orthopods here was that using a bone-tendon-bone patella tendon autograft to reconstruct torn ACLs in the younger more active athletes (soccer players and football players) is preferable to a hamstring graft or allograft. Allografts did not seem to be the graft of choice by any of the docs for the younger patients. Some would use a hamstring autograft provided there was no MCL pathology. The PTG autograft was the gold standard for years (always my favorite graft choice for high level/demand athletes) so I was pleased to see the trend for this population moving away from the ST/gracilis HS grafts. Kevin Wilk, DPT (primary PT for Dr. James Andrews), was advocating restoring full and symmetrical ROM after ACL surgery. I tend to agree with this principle myself. However, Dr. Noyes was not in agreement and rather cautiously noted he would be okay with about 3 degrees of hyperextension on the repaired side no matter how much hyperextension was available on the other side. Kevin also noted that restoring full flexion was paramount to restoring running mechanics and speed in higher level athletes. The golden time to repair a MCL tear is in the first 7-10 days. Dr. Paulos also suggested it is absolutely necessary to fix the deep layer as well as the superficial layer. His talk emphasized how big of a mistake it is to not repair the deep layer. He also warns that the strength of the repair is less important than restoring proper length, tension and collagen. For PCL augmented repairs, a 2 bundle repair is repaired. Most of the docs like to use a quad tendon autograft from the contralateral thigh, but will take it from the same leg if patients insist. The consensus seemed to be that a repair should be done if there is 10 millimeters or more of drop off. These are just some of the highlights I wanted to pass along. There was lots of other good stuff (much of it a nice review of anatomy, biomechanics and protocol guidelines for rehab) but I wanted to pass along some of these key items while they were fresh in my head. I will likely be sharing more in the future, particularly with respect to patello-femoral pain and SLAP tears as these are just so controversial in terms of surgical and rehab management. Should I Have Shoulder Surgery? I probably get more emails about shoulder problems than anything else. Most of the emails center on rotator cuff and SLAP tears, as well as whether or not to have surgery. Let me be clear – I am not going to tell you TO or NOT TO have surgery in this post. That is for you and your MD to decide. However, I will give you my thoughts on key considerations with respect to this major decision. Below are some major considerations to take into account if you are facing this dilemma. These thoughts are mostly relative to rotator cuff pathology. SLAP tears are a much different animal in that they often do not do well conservatively with rehab, particularly in active patients. I approach SLAP tears in rehab much like I do a cuff problem, but the varying degrees of SLAP tears and associated involvement of biceps tendon pathology and/or rotator cuff damage make the treatment algorithm more challenging. What I san say with confidence is that shoulder surgery is never quick and easy. The shoulder is such a complex and pain sensitive joint that whether or not you have arthroscopic or an open repair, the rehab and recovery process is often painful and laborious. This is not to deter you, but more so to make you aware that once you wake up from surgery your shoulder will not be back to normal, nor is there any guarantee your shoulder will be as good as new again. You understand that there is no problem surgery cannot make worse (quote from Dr. Jack Hughston). Finding a skilled and competent shoulder surgeon will certainly lessen the complications and recovery window. So, when faced with the prospect of surgery, be certain to exhaust conservative measures first, seek multiple MD opinions, get an X-Ray/MRI, and weigh the current functional deficits with the desired functional level to determine the best course of action.